I first landed on the east coast almost a decade ago, my initiation into dairy farming was watching the herdswoman, Judith, at Hawthorne Valley Farm tend the sixty Brown Swiss beasts. “I can never do that, but how freaking inspiring…” It’s an understatement to say that much has changed for me over these years. Like I mentioned in other posts, I started farming at educational farms because I liked working with kids and teenagers. I became so engrossed with the “behind the scenes” farmscape that I left the kiddos for real farm work. At Hawthorne Valley I thought I couldn’t wake up at four to start milking, or stay up until nine to wrap up the evening milking. I soon found out that a dairy farmer makes their own schedule (at that time, they were prudently following a twelve-hour-between milkings doctrine). 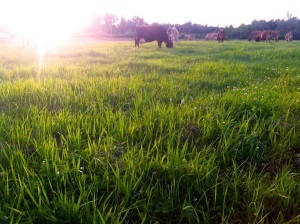 Many dairy farmers choose to milk once a day, Adam Wilson of Bread and Butter Farm among my closest friends of this ilk. Luckily for him, if the cow isn’t suited for once a day milking, he has a good market for beef—it turns out that hosting Burger Night at their farm is more profitable than dairy farming anyway (some farmers keep milking for the joy). At Hawthorne Valley I was incredibly inspired but also intimidated by the workload in dairy farming. When I moved to apprentice at Farm and Wilderness (Summer Camp and year-round school program), hand milking two cows gave me a lighter perspective in dairying. At that time, I locked myself into the farming side of the educational farm. 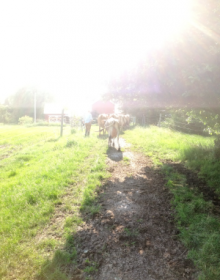 Hand-milking was a sweet experience, but I yearned for the herd and felt ready to tackle that kind of workload. I moved to Brattleboro, VT, and landed at Lilac Ridge Farm where I found a herd of looming Holsteins and Brown Swiss, and a couple years of phenomenal training. I mentioned the importance of having a good attitude in a previous blog, but here I want to officially recognize Ross and Stu Thurber, the father-son duo from whom I learned so much from. Stu elegantly handed the farm over to Ross a number of years ago, and Ross switched from plowing some fields for corn silage to alfalfa baleage, putting up and taking down fencing; they now ship their milk to Organic Valley. The best part of working with the Thurbers was their ceaselessly positive dispositions… pushing through the dark mornings that were thirty degrees below zero, when it barely became light at the end of milking, somehow they maintained steady smiles and shared encouraging words. During of those brutally frigid spells, the electricity had gone out and as the tractor’s generator was blaring in the background, I was cleaning up the milkhouse when Ross commented, “I really appreciate your upbeat attitude through mornings like this…” I’m the optimistic type, but at that moment I realized that I’d imbibed more from working with the Thurbers than just fencing technique and cow care. After years of my passionate quest for herdsperson training, I’ve started my own gig this spring… the aspect of the North Country Creamery that I hadn’t vehemently pursued until recently was the Creamery. Until this past fall and winter, processing milk hadn’t interested me, in fact even a year ago, I abhorred the thought of spending so much time inside and being so clean. 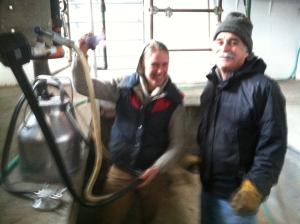 I couldn’t pass up the opportunity to take over Clover Mead Farm from the retiring Sam Hendren, equipped with the infrastructure to process milk, and the mentor to show me the ropes. Starting this venture, I thought for certain I’d partner with a cheese-maker; since last fall, I hadn’t found an experienced cheese-maker business partner, but I did quite unexpectedly fall in love with the ceaselessly supportive Steven Googin. Trying not to maintain expectations, I ended up inspiring him to move from Greyrock Farm in central NY, to Keeseville over the course of the winter. Sam ended up bequeathing us both his knowledge of cheesemaking, starting with pots of milk on the kitchen stove in January, moving up to the 200-gallon vat this spring. He guided us through the process time after time, and encouragingly relays thoughts and advice via text at the drop of a hat. Now we’re getting consistent vats, but when we first fired up the boiler in the creamery, we were all confounded when the cheese wouldn’t set, for example. “Another day of adventure and growth at the North Country Creamery,” he comments as we’re pitching the milk for the pigs. “Yeah… you had growth too, Sam?” I asked. Sam’s support has been uncanny, his sarcasm and wit unparalleled… it’s shown me that farmers can be inspired with a variety of attitudes toward life.